In the developed world, we hear about health problems that stem from overabundant diets - from obesity to gout, yet in the developing world, the health problems come from malnutrition, the direct opposite. Policymakers and activists around the world are trying to remedy this, and one social enterprise hitting both these birds with one stone is Table for Two. Founded in 2008 in Japan, Table for Two has been helping feed children in poverty-stricken parts of Africa and China through donations made from restaurants in more developed nations. The consumption of healthy meals in restaurants, offered through partnerships between Table For Two and restaurants, raises money for the children's meals. 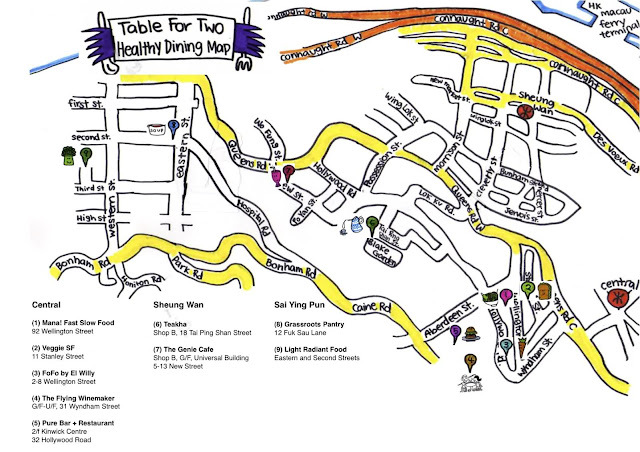 Table for Two was brought to Hong Kong late last year, and the team here have devised a great "Healthy Summer Dining Experience" in August (starting August 1st). Buy the designated "Table For Two" meal (or drink) at their partner outlets, a portion of proceeds will go to charity, and by snapping a picture of your meal, there are prizes to be won too. I was lucky enough to have been brought along on a little food crawl with the lovely ladies of Table For Two to get a sneak peek on some of the fab food and drink on offer. 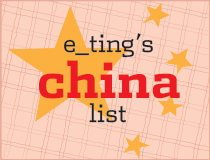 It was lovely to see so many great names on the list of participating restaurants (and bar). We didn't cover all of them on the crawl, so do check out the map (above) for the full list. The Genie Concept, known for their juice cleanses, is offering organic pineapple & kale juice. I'd long known that Chinese kale (gai laan) is full of antioxidants, but had never even thought of making juice out of it before - turned out to be great! An ace summer drink. Grassroots Pantry, the oh-so-sweet cafe in Sai Ying Pun with wholesome, veggie and vegan fare is offering a quinoa salad with orange hazelnut dressing. Peggy Chan, the chef at Grassroots, explained that red quinoa is used in the salad, along with dried cranberries, hazelbuts and walnuts. It was filling but in the best way. Stephanie welcomed us with a shy smile said quite simply, "I want people to come in, and after eating the food, leave feeling better". For Table for Two, she's offering a black bean veggie burger with a huge salad that includes her homemade pickled zucchini. The patty was so full of flavour, with crisp edges goes with a generous dollop of salsa verde. 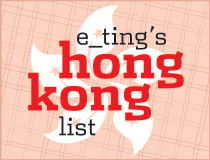 I'll definitely be coming back for this, and (note to self) a Sai Ying Pun food crawl soon! The chilled staff at MANA! MANA! Fast Slow Food is another eatery on the list, and this little oasis in bustling, traffic-jam prone Wellington Street (walk, you silly nutters!) has been bursting at the seams since day one - just goes to show that Hong Kong is hungry for healthy! Teakha was our dessert stop, and they're offering a lemon cream tart. The gingersnap base is addictive and, well, you should know by now how much I love Teakha! The Flying Winemaker, helmed by winemaker Eddie McDougall, one of Time Out Hong Kong's "20 People Changing the Way You Eat & Drink, is also in on the cause. At his wine shop/bar at the top of LKF, the Table for Two drink is the Eddie McDougall Cabernet Merlot 2010, from King Valley, Victoria, Australia. An easy-to-drink, medium bodied quaff bright with red berries. Other participants include FoFo by El Willy, Pure Bar + Restaurant, and Veggie SF. The Experience and competition is for the whole of August. Check out the posts on Table For Two's blog for more. I love the concept, and in general, I love the sustainability of social enterprises (because, ahem - shameless plug - I'm running one myself!) What could be better than being able to eat and give at the same time? I like this concept a lot! I believe that small, well thought out efforts are the only way to obtain true and lasting change in the world. I think that it's always good to remember that those of us in more developed nations have it very good while the majority of the world's population doesn't. Beautiful photos and post, Janice! Thank you for coming on the tour! !